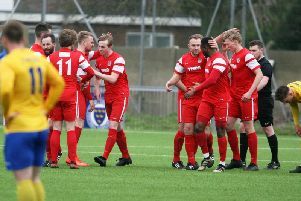 Horsham’s game management was praised as they overcame difficult conditions away to basement boys Greenwich Borough on Saturday. Goals early in each half from Joe Shelley and Chris Smith from the penalty spot gave the Hornets their 18th win of the season. It kept them second in the Bostik League South East Division and with victories for all the fellow play-off chasers, maintains their narrow lead over Ashford United, Hastings United and Haywards Heath. 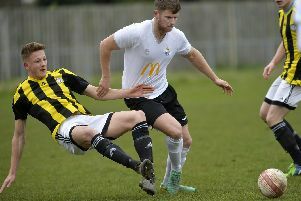 Hornets manager Dominic Di Paola was pleased with their performance as they battled swirling winds and a fairly poor playing surface in south east London. He said: “I think the conditions made it really hard. The combination of the pitch being quite poor and the wind - although most people would have had an issue with the wind over the weekend. “Trying to manage those things against a team this is fighting for their life at the bottom made it hard. “The boys were brilliant, it was not a vintage footballing performance, but I was really happy with how they dealt with things. In their battle to beat the drop, Greenwich made four signings during the week and started all of them in Jack Sammoutis, Charlie Allen, Teshuane Tyreece-Walters and Theo Fairweather-Johnson. The Hornets made two changes from the defeat at Cray Wanderers with Steve Metcalf replacing the injured Lewis Hyde and Chris Smith coming in for Dan Pearse, who begun a three match suspension. The visitors led after just four minutes when Lee Harding’s free-kick picked out the arriving Shelley to glance in a header past young Crystal Palace loanee goalkeeper Ollie Webber. Greenwich responded with two decent chances as Tyreece-Walters twice headed over. Smith saw his squeezed attempt blocked by Webber and Jack Brivio curled just wide, before Smith crossed for Harding, but he someone fired over from close range. The wind got worse in the second half, but again the Hornets profited from a defensive mistake nine minutes after the restart. Referee Jonathan Bolland spotted a shove on Shelley and instantly pointed to the spot. Smith had to re-spot the ball after it had blown off, yet held his nerve to stroke the ball down the middle of the goal. Greenwich continued to ask questions and a couple of blocks were required from Shelley and Josh Pelling as well a save pair of hands from a Joe Wicks drive. At the other end, Smith looked like he would make it three, but Tyrell Richardson-Brown’s lay-off took a bobble at the last moment. Greenwich’s Olutoysi Olusanya was also denied by Pelling as Horsham claimed the points. Horsham: Pelling, Metcalf, Shelley, Merchant, Sparks, Harding, O’Toole, Brivio (Lovegrove 87), Hayward, Lavery (Richardson-Brown 73), Smith. Unused: Hyde, Kirkwood, Hogan.